Through the Veterans Legal Services Project, partner Lou Klein has led a team of attorneys in sponsoring and running Veteran’s legal clinics at Patriotic Hall in downtown Los Angeles for almost two years. Their efforts help vets address legal issues to overcome obstacles obtaining employment and housing. Terrie Sharp provides pro bono legal services through the Detroit-based Legal Aid and Defender Association, assisting clients primarily in the areas of identity theft, criminal expungements, federal pardons, and issues involving the Federal Fair Credit Reporting Act. With Terrie’s assistance, individuals are able to rebuild their lives and realize greater success pursuing employment and housing opportunities. For her efforts, Terrie was recently named the Detroit Legal Aid & Defenders Pro Bono Lawyer of the Year. In recognition of the firm’s 25th anniversary year in 2014, we expanded our Pro Bono Practice efforts by joining a remarkable organization – the Pro Bono Institute (PBI). As a signatory to its Law Firm Pro Bono Challenge®, we join leading national and international firms in committing our firm to donating a minimum percentage of our annual profits to providing legal services to those who otherwise could not afford our representation. The entire Chicago office participated in a workshop to prepare living wills for seniors through the Center for Disability and Elder Law. The Center serves high-need communities throughout Chicago and suburban Cook County. Partner Lisa Lamm Bachman provides a voice for those who are often unheard by representing domestic abuse victims and their children through volunteering as an attorney with Tubman’s Safety Project. Lisa also volunteers at the Children's Law Center of Minnesota, and serving on the board of directors for the Battered Women's Legal Advocacy Project. For her efforts, Lisa has been named the 2016 Tubman Safety Project Attorney of the Year, and was a previous recipient of the Journey of Hope Award presented by the Battered Women's Legal Advocacy Project. Claire Kossman serves with the Lawyers’ Committee for Better Housing, defending people who are being evicted from their homes. Claire has worked with a number of clients to help them not only stay in their homes but negotiate fair terms with the landlords. Her work has included rent re-negotiations, compensation for mold damage or other dwelling issues and even free rent to those who have been treated unfairly. As a Guardian Ad Litem for the Dade County Circuit Courts, Virginia Johnson protects the interests of minor children who have received monetary settlements from accidents or injuries. She works hard to ensure that the child’s settlement is not exploited and that the monies are used in the child’s best, long-term interests. Virginia has served as a GAL in approximately 25 cases, volunteering more than 120 hours of pro bono time. As a certified Fee Arbitrator for the Florida Bar, she also arbitrates fee disputes between clients and their attorneys. Tessa Mansfield, named a North Star attorney by the MSBA for her pro bono work, provides immigration legal services to Mid-Minnesota Legal Aid. She recently helped a young man from El Salvador obtain a Special Immigrant Juvenile Status after he was abandoned by his parents. This is just one example of how Tessa is making a difference for those with immigration needs. 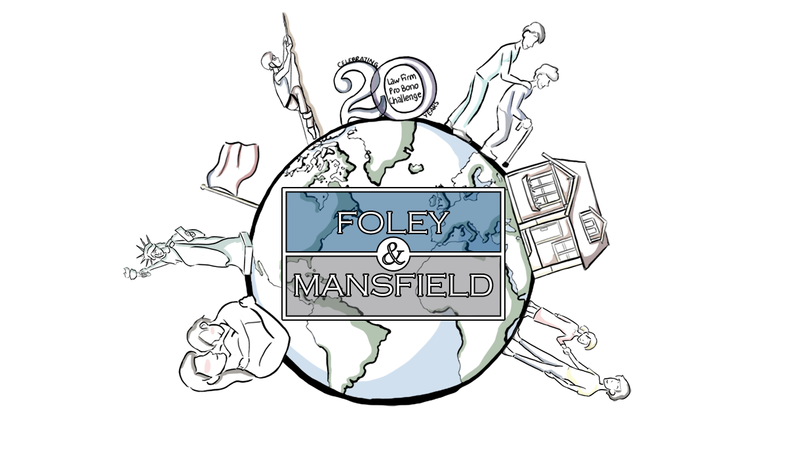 At Foley & Mansfield, we have the same commitment and employ the same creative approach in representing pro bono clients as we do in representing our core clientele. Our attorneys embrace volunteerism, including pro bono legal services. Since 2003 - when we first established a formal Pro Bono practice - our attorneys have represented a wide variety of low-income individuals and nonprofit organizations. Each year we devote hundreds of hours to this effort. Much of the firm’s pro bono representation is acquired through local and regional nonprofit agencies in the states where Foley & Mansfield has offices. These include organizations such as the Volunteer Lawyers Network, Legal Aid Society of Minneapolis Volunteer Family Law Program, Central Minnesota Legal Services Volunteer Attorney Program, Bay Area Legal Aid, Community Legal Services, Legal Aid Foundation of Los Angeles, Legal Services of Eastern Missouri, St. Louis Volunteer Lawyers Program, and the Eastern District of Michigan Federal Bar Association Pro-Bono Council, and many others.